Aufhauser offers a wide range of soldering alloys for a variety of applications, from HVAC and plumbing joints to electronics and semiconductor assemblies. Every Aufhauser solder meets the highest standards for consistent performance and purity. Aufhauser solders conform to various Federal, NSF and/or ASTM specifications. Below are listed the primary families of solder alloys. For additional information please contact us. Tin-Silver Combination Developed as a lead-free alternative, Tin/Silver alloys offer superior strength compared with other solders. Excellent flow makes the switch from lead an easy choice. Choose from 96/4 and 95/5. Tin-Antimony Combination Also developed as a lead-free choice, this alloy provides improved performance over the Tin-Lead alloys, and is more economical than the Tin-Silver alloys. Available in composition 95/5. 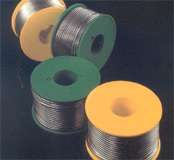 Tin-Lead Combination Used for centuries as the primary alloy for soldering, this family offers an extensive variety of options. Environmental and health concerns over lead have limited its use. Choose from 50/50, 40/60, 60/40. Also available in paste form. Tin-Zinc Combination Primarly used to join "tough-to-solder" aluminum alloys. Ability to join aluminum alloy to dissimiliar metals and to itself. Tin-Bismuth Combination Formulated as eutectic 58Bi/42Sn alloy, this solder paste is lead-free, halogen-free, and has low activation temperature, with exceptional wetting performance in air reflow. If it turns out that your assembly process requires solder fluxes instead, Aufhauser carries an assortment to meet your project requirements.